The 26-year-old KL Rahul hasn’t had the best of times in the ongoing Test series against Australia. He couldn’t perform with the bat in the first three Tests in Adelaide, Perth and was then dropped from the third Test at the Melbourne Cricket Ground (MCG). He scored 44 runs in the second innings of the Adelaide Test, but that wasn’t enough to convince the selectors about his recent form. Nevertheless, despite his poor run of form with the bat in hand, the Karnataka batsman was included for the fourth and final Test at the renowned Sydney Cricket Ground (SCG). In the first innings, he flattered to deceive and could only score nine runs from six balls with a couple of boundaries. Fast bowler Josh Hazlewood accounted for his wicket as Rahul nicked the leather behind the wickets. After getting dismissed, he immediately headed to the nets in order to practice. He may not get a chance to bat in the second innings bearing in mind the state of the match. In the meantime, Rahul won a few hearts with his gesture while fielding. The incident took place in the first ball of the 15th over when left-arm spinner Ravindra Jadeja was bowling to the left-handed Marcus Harris. Harris danced down the track and tried to clear the mid-on fielder, but couldn’t time the ball to perfection. KL Rahul was patrolling that region and he dished out a full-length dive in an attempt to catch hold of the ball. 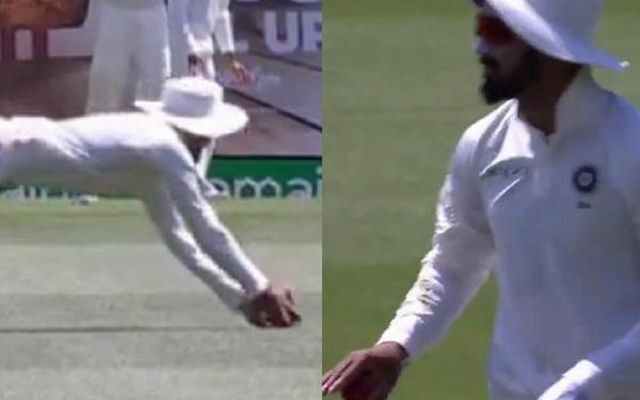 Jadeja ran towards him in celebration, but immediately, Rahul signalled that he wasn’t sure about the catch and that it most probably had touched the ground. Jasprit Bumrah went up to him applauded him for the gesture. Even on-field umpire Ian Gould lauded the cricketer for his honesty on the pitch. At that point in time, Harris was on 24 runs from 36 balls and he went on to score a gutsy half-century. In the meantime, Twitterati is delighted with Rahul’s attitude and the users on the social media platform appreciated him.